Some days, especially when it's 45 degrees, I like to come home and snuggle up in a sweatshirt. 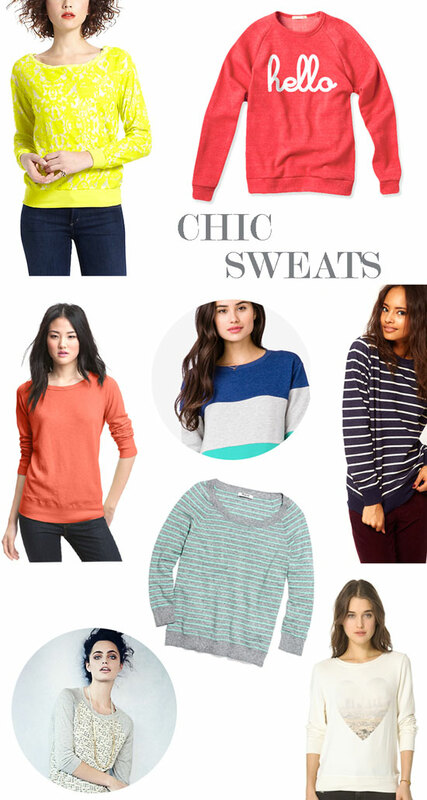 I've never been one to wear sweatshirts out in the real world -- okay, maybe to the grocery store sometimes -- but that might change thanks to these finds. And this way, I wouldn't even be embarrassed to bump into someone I know in the checkout line. I would, however, be embarrassed by the pints of Ben & Jerry's in my hands. I say do. When I was little my mom had a few seat shirts made by Hang Ten in nice colors. They looked super cute with jeans and the moccasins she used to wear (think 1970's preppy). I have a battle with sweat pants because my friend don't know when and when not to wear them. If your going to a concert, no. If your going to a restaurant, no. If your going to a bridal shower, no. Especially the sweatpants w/ matching sweatshirt combo. No. But I have no problem wearing them if I'm running errands or hoping to pop into the gym during the day or just when it's a lil snippy. Haha omg I tried on that exact gray and lace sweat shirt yesterday in Forever21. I didn't end up getting it but I did end up spending $118 on sheer summer clothes for summer. I own the hello sweatshirt in two colors (red and gray)! I seem to wear them both at least once a week... I might have a problem with wearing sweats too much in public! Working with kids, it is often the easiest thing to throw on for field trips or colder days in the classroom. Haha. I agree! I love these pics--and when it is cold outside--nothing better than coming in and changing into some comfortable clothes. Love the lace sweatshirt. Loving the stripes and the coral color! Love the Hello sweatshirt! Such a chic look! I was just eyeing that red hello sweatshirt. Sometimes you and I are on the exact same page, it's kinda freaky.